1.1 This specification2 covers nominal (average) wall seamless and welded carbon and alloy steel pipe intended for use at low temperatures and in other applications requiring notch toughness. Several grades of ferritic steel are included as listed in Table 1. Some product sizes may not be available under this specification because heavier wall thicknesses have an adverse effect on impact properties. (A) For each reduction of 0.01 % carbon below 0.30 %, an increase of 0.05 % manganese above 1.06 % would be permitted to a maximum of 1.35 % manganese. (B) Where an ellipsis (...) appears in this table, there are no reporting requirements for those elements. 1.2 The values stated in either SI units or inch-pound units are to be regarded separately as standard. Within the text, the SI units are shown in brackets. The values stated in each system may not be exact equivalents; therefore, each system shall be used independently of the other. Combining values from the two systems may result in non-conformance with the standard. The inch-pound units shall apply unless the “M” designation of this specification is specified in the order. 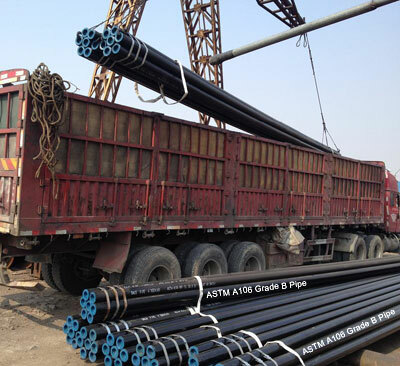 1.1 This specification covers seamless carbon steel pipe for high-temperature service (Note 1) in NPS 1/8 to NPS 48 [DN 6 to DN 1200] (Note 2) inclusive, with nominal (average) wall thickness as given in ASME B36.10. It shall be permissible to furnish pipe having other dimensions provided such pipe complies with all other requirements of this specification. 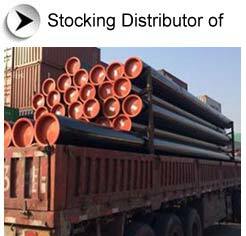 Pipe ordered under this specification shall be suitable for bending, flanging, and similar forming operations, and for welding. When the steel is to be welded, it is presupposed that a welding procedure suitable to the grade of steel and intended use or service will be utilized. Note 1: It is suggested, consideration be given to possible graphitization. Note 2: The dimensionless designator NPS (nominal pipe size) [DN (diameter nominal)] has been substituted in this standard for such traditional terms as "nominal diameter", "size", and "nominal size". 1.2 Supplementary requirements of an optional nature are provided for seamless pipe intended for use in applications where a superior grade of pipe is required. These supplementary requirements call for additional tests to be made and when desired shall be so stated in the order. 1.3 The values stated in either SI units or inch-pound units are to be regarded separately as standard. The values stated in each system may not be exact equivalents. Therefore, each system is to be used independently of the other. 1.4 The following precautionary caveat pertains only to the test method portion, Sections 11, 12, and 13 of this specification: This standard does not purport to address all of the safety concerns, if any, associated with its use. It is the responsibility of the user of this standard to establish appropriate safety and health practices and determine the applicability of regulatory limitations prior to use. the specified maximum will be permitted up to a maximum of 1.35%. an increase of 0.06% manganese above the specified maximum will be permitted up to a maximum of 1.65%. (3) These five elements combined shall not exceed 1%.